"Many people have influenced my thinking on human nutrition and metabolism, but one person stands out as completely altering my understanding of why we get fat. That person is Stephan Guyenet." "In a world of increasing information overload, Dr. Stephan Guyenet’s research and writing is like a gem in the rough. He has a remarkable ability to distill the latest scientific research and communicate it in a clear and engaging way, and his level-headed, evidence-based approach sets him apart from the pack." "A remarkable book that approaches health and weight management not through diet or fitness, per se, but by understanding and combating the urge to overeat. This fun, insightful, and important text will appeal to both science-lovers and fitness fanatics." "Following in the footsteps of Daniel Kahneman's Thinking, Fast and Slow, Guyenet looks to the structure of the human brain and how it has evolved over time... A helpful guide offering encouragement to those looking for ways to lead healthier lives." 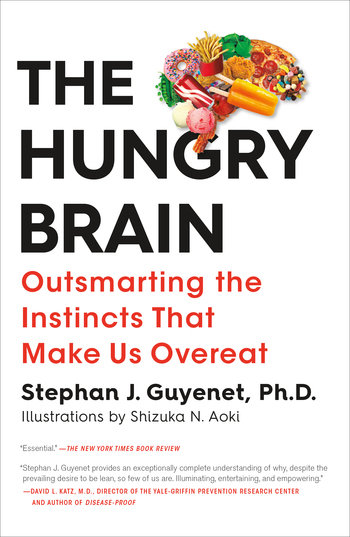 "Blending detailed attention to the neurobiology of appetite and genetics with a sweeping view of human evolutionary biology, Stephan Guyenet provides an exceptionally complete understanding of why, despite the prevailing desire to be lean, so few of us are. The lessons of science, spanning decades, are presented clearly, interpreted fairly, and used as the basis for an eminently sensible set of responses. Illuminating, entertaining, and empowering, The Hungry Brain is highly recommended." "The Hungry Brain explains how a modern diet turns us into leptin-resistant junk food seeking zombies. Everyone with an interest in metabolism will enjoy Stephan Guyenet’s engaging and sometimes witty walk through the fascinating world of neurobiology." Stephan J. Guyenet, Ph.D. is an obesity researcher and health writer whose work ties together neuroscience, physiology, evolutionary biology, and nutrition to offer explanations and solutions for our global weight problem. He received a B.S. in biochemistry at the University of Virginia and a Ph.D. in neurobiology at the University of Washington. He is the author of the popular health website, Whole Health Source, and is a frequent speaker on topics of obesity, metabolism, and nutrition.